It was Louis Pasteur who said, “Fortune favors the prepared mind.” We usually hear the quote paraphrased as, “Luck favors the prepared.” For travel photographers, there is often a great deal of luck involved in capturing a truly great image, but there are some very useful tools that we can use to help us plan to be in the right place at the right time with the right gear. Let’s look at just a few of my favorites. I’ll start with a quick review of the most obvious resources. I would never plan an hour-long photo shoot, let alone a month-long trip to a far-flung travel destination, without doing some research. What are the must-see locations, and what dates and times of day are perfect for each one? What are the events or activities that most authentically represent the locations I am visiting? Is there a livestock market, a street festival, or a religious celebration taking place while I’m in the region? How can I build an itinerary that best incorporates all of these locations? Great resources for this type of research include guidebooks (online and hardcopy), online review sites such as Trip Advisor and Yelp, mapping and navigation apps (Google Maps is still my all-around favorite, but several others have their own advantages), and local weather sites. I like to build my itinerary by customizing an online map to show all of the locations I’d like to visit, then creating a routing that links the locations in the proper order. If travel by air, rail, bus, or boat is involved, I research those schedules and fares to determine the best way to get from one place to the next. Airline consolidation sites such as Orbitz can be quite helpful for finding the best flights at the best prices. If the itinerary has been pre-planned by a travel company, then I will still do most of this background research to better understand the locations we’ll be visiting. Once I know where I’ll be going and what events I plan to shoot, I develop a shot list. Some photographers craft very detailed and specific shot lists, but I like to keep it quite flexible and informal, often simply jotting down my ideas in the calendar event on my phone that is associated with each planned shoot. After all, if I adhere too closely to a shot list, I will just end up with the same images that hundreds or thousands of other visitors have captured after doing the same research. Serendipity and the artist’s eye have their place in travel photography, too. The research phase can also inform me as to what clothing, gear, and other essentials I should bring to each location. Now I’d like to introduce three smartphone apps that I consider indispensable for travel photography. First, there’s Photo Pills, an app that incorporates several essential tools into one package. I use Photo Pills for planning shots where I need to know how to get all the elements, including location, date, and time of day, to come together. For example, during the Perseid Meteor Shower, I wanted to find a dark sky location with a nice foreground and a view toward the galactic core of our Milky Way. This way, I could capture images including the meteor shower, the Milky Way, and the pretty landscape in the foreground. 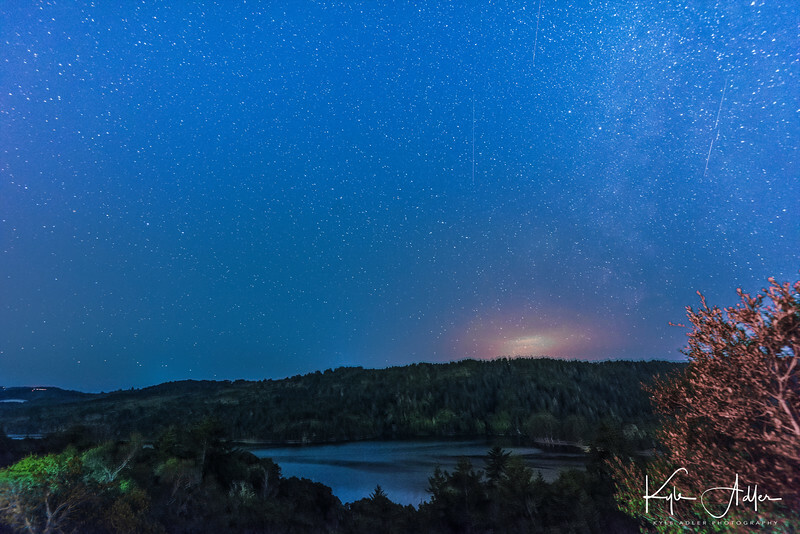 I had a location in mind, a beautiful spot where there isn’t too much light pollution and with a gorgeous view over a reservoir and the Santa Cruz Mountains. The Planner tool in Photo Pills allowed me to visualize the foreground as viewed by my phone’s camera, superimposed against the Milky Way as it would appear on different days and times of day. I planned the shot for a certain time on each of several consecutive days, confirmed that the Milky Way would be rising in the desired direction and that the nearly full moon would have already set, and then waited for clear weather. The first night of the meteor shower was cloudy, but the second night was the charm, and I was able to capture this striking image. Here’s a screenshot of the Planner tool in Photo Pills that I used to prepare for this shoot. The Photo Pills app has a number of tools to help plan and execute your shots. 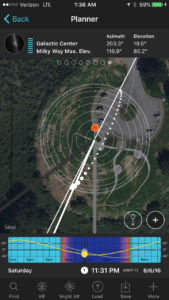 Another useful app for planning the best locations, dates, and times for your shoots is TPE (The Photographer’s Ephemeris). I find this tool to be especially helpful for visualizing the path of the sun and moon across the field of view for any location I select. This app is very powerful, and I have only scratched the surface of what it can do to predict and prepare for photo opportunities. 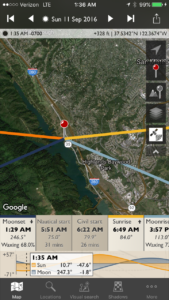 The Photographer’s Ephemeris (TPE) is a powerful tool for planning any outdoor photo shoots. A final app I will mention here is called Easy Release. Sometimes (read this post for details about model releases), we need a model release when a person or several people are clearly identifiable in a photo. I know some photographers who carry hardcopy model releases with them wherever they travel, but I find this to be cumbersome and impractical when on the road shooting. Instead, I use Easy Release on my phone, so I’m always ready to quickly prepare a release for a new friend to sign when they appear in my images. Even though the app has the ability to translate the text of the release into several languages, there are situations in which it isn’t reasonable to try to explain to a local person what’s in the release and why it’s required. Furthermore, I consider it to be exploitative if the person can’t reasonably be expected to understand what’s in the document or why they should be signing it. But there are times when having immediate access to a model release that can be prepared, signed, and stored right on my phone is a big advantage. Easy Release is a convenient tool for creating, signing, sharing, and storing model releases when a person is clearly identifiable in photos. With proper planning using readily available resources and various apps including the ones I’ve presented here, we can be better prepared to maximize our chances of capturing memorable images. Happy shooting, and remember that luck favors the prepared! Do you have a favorite tool you use to plan for your photo adventures? How have you used this tool to get your shot? Please share your experiences here. Want to read more posts about tools for planning your travel photography? Find them all here: Posts on Planning. A final app I will mention here is called Easy Release. Sometimes (and exactly when is a good topic for a future post), we need a model release when a person or several people are clearly identifiable in a photo. I know some photographers who carry hardcopy model releases with them wherever they travel, but I find this to be cumbersome and impractical when on the road shooting. Instead, I use Easy Release on my phone, so I’m always ready to quickly prepare a release for a new friend to sign when they appear in my images. Even though the app has the ability to translate the text of the release into several languages, there are situations in which it isn’t reasonable to try to explain to a local person what’s in the release and why it’s required. Furthermore, I consider it to be exploitative if the person can’t reasonably be expected to understand what’s in the document or why they should be signing it. 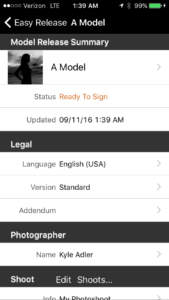 But there are times when having immediate access to a model release that can be prepared, signed, and stored right on my phone is a big advantage.